What happens when The Boomers Retire? 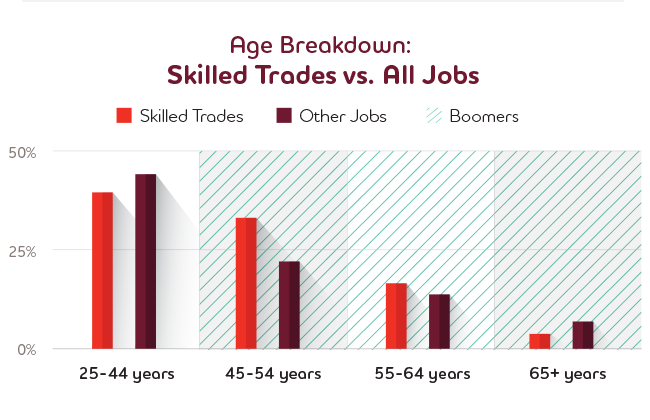 Baby Boomers are saying goodbye to their jobs in construction, manufacturing and engineering, and younger generations are looking for work outside of those industries. So, who exactly is replacing the Boomers? How are Baby Boomers employed? 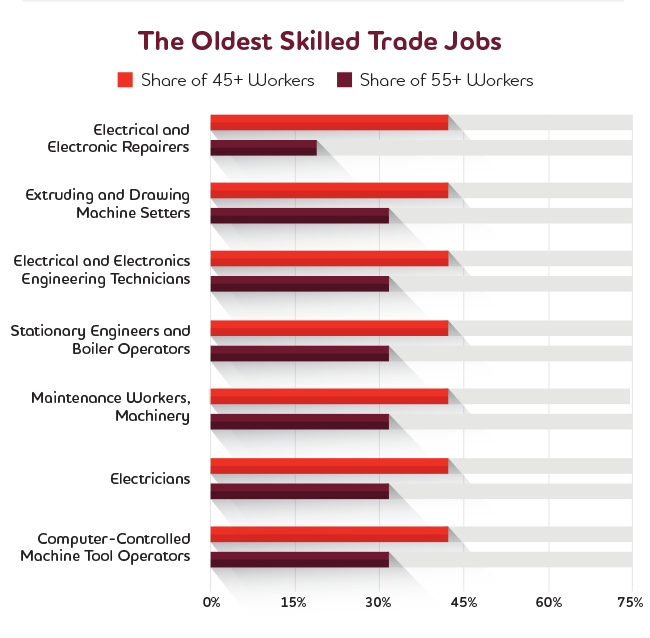 Many Boomers have vocational careers and occupy lots of our country’s skilled trade jobs. Check out how the ratio of those who work "skilled trades" vs. "other jobs" is reversing (in favor of "other jobs") among younger workers. Which positions will be most affected? Baby Boomers hold a sizable majority of the following positions. It’s time to figure out how we’re going to fill them. The percentage of firms struggling to fill important skilled trade positions. 32% of billion-dollar manufacturers estimate they’ll lose over $100 million as Boomers retire over the next five or so years. Ouch! 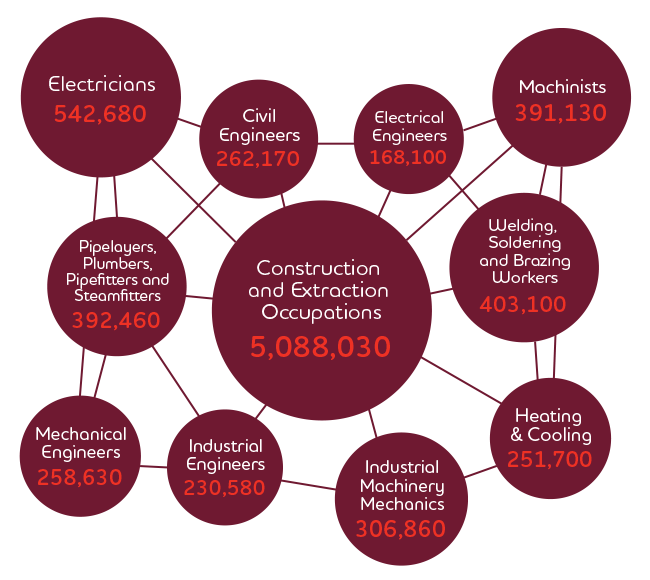 The percentage of firms that predict a shortfall of qualified skilled trade workers, according to an Associated General Contractors of America (AGC) survey. The number of positions that will be left vacant by 2020 due to Baby Boomer retirement estimations. What can be done to fill this gap? A state-funded workforce training initiative in Georgia, it has worked with manufacturers like NCR, Kia Motors, and Mitsubishi Power Systems to create a new workforce with an economic impact of $417 million. This Massachusetts program offers customized training for employers and workers in vocational trade skills. It has a turnover of twelve graduates every eight weeks, 80% percent of whom go into manufacturing. Ohio Treasurer Josh Mandel began this initiative to recognize Ohioans working in manufacturing and skilled trades. Its aim is to generate buzz around skilled trade industries, inspiring youth to pursue vocational skills training. How about a promise to create 10,000 work-based learning opportunities (a.k.a. Apprenticeships) by 2020? That’s what we plan to do! Our Youth Employment Solutions (YES!) Program in Kentucky partners with the state’s Department of Education and local businesses to help students develop trade skills. The best part? We’ve seen a 96% success rate. Love the idea of apprenticeships, but nervous to start a program? We've heard your apprehensions, and are prepared to ease them. See why science, technology, engineering and mathematics (STEM) fields – and job prospects – are on the rise.